It is a year since the launch of the Equal Representation in Arbitration Pledge – marked yesterday at GAR Live London, a drinks party at Freshfields Bruckhaus Deringer and the Who's Who Legal Awards. In recognition of the under-representation of women on international arbitration tribunals, members of the arbitration community drew up the Pledge in 2015, with Sylvia Noury of Freshfields in London as a driving force. 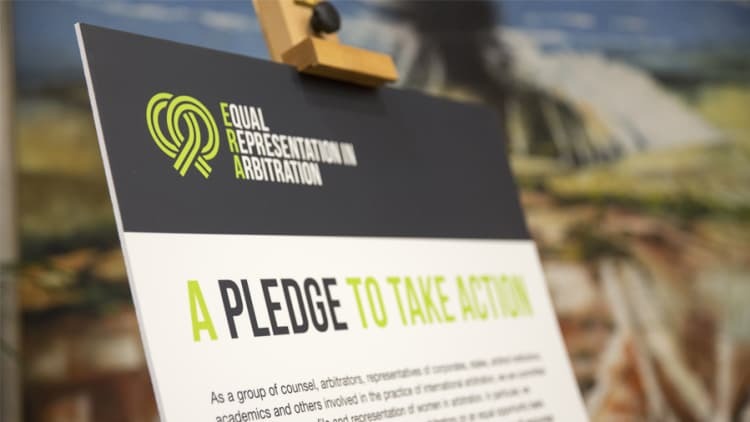 Signatories declare their commitment to improving the profile and representation of women in arbitration and ensuring they are appointed as arbitrators on an equal opportunity basis. The Pledge was launched at GAR Live London last year and has since been rolled out across the world. As of 12 May, it has signatures from 1,875 individuals or organisations from 93 countries from Nicaragua to South Korea. Most of these were added at breakfasts or dinners held to promote the Pledge. In March, the Pledge was named the best development of 2016 at the GAR Awards in Milan, following a resounding win in a public vote. Speaking at a celebratory drinks party at Freshfields in London last night, Wendy Miles QC of Debevoise & Plimpton, who co-chairs the Pledge’s steering committee with Noury, spoke of the initiative’s rapid impact and global reach. Also representing the committee were Juliet Blanch and Noury. The latter brought her eight-week-old baby, Sebastian, who was 'on message' in a “Take the Pledge” babygrow. One of the commitments of arbitral organisations that have signed the Pledge is to publish statistics relating to gender diversity. In statistics for 2016, released just seven months after the launch, the ICC International Court of Arbitration reported that its proportion of female arbitrators had risen from 10% to 15%, Miles said. At the HKIAC, 18% of arbitrators were female and, at the LCIA, 20%. But these encouraging percentages are mostly down to the efforts of the institutions, who regularly appoint women when they have the power to do so, Miles noted. Now the challenge is to change the behaviour of counsel and corporations when they appoint. A “happy side effect” of such efforts is that the pool of arbitrators is replenished with “new blood” and that diversity improves “across the board,” she said. “Achieving gender diversity is just the first step”. The efforts may also help to solve the problem of the exit of women from the legal profession at mid-level, which means the equal numbers of men and women seen in law schools and in the early years of practice is rapidly eroded. Miles finished by urging signatories of the Pledge to continue to promote it in the arbitral community and to remember that they had “signed up to do something”. Signing alone is not enough. At GAR Live London, held at Freshfields earlier in the day, the Pledge was an inevitable talking-point. The importance of the initiative was highlighted by one delegate, who recalled an experiment by Dubai-based Freshfields partner Erin Miller Rankin whereby a list of arbitrators was drawn up based on redacted CVs that included their qualifications alone and no information on their gender. As a result of this internal process, a list including predominantly women arbitrators was submitted to a Middle Eastern client, who ended up picking a Jewish woman as arbitrator. Reflecting on the Pledge’s impact so far, LCIA director general Jacomijn van Haersolte-van Hof admitted to being disappointed that arbitral institutions are still doing the bulk of work on promoting diversity, rather than parties or law firms. The LCIA cannot continue to "grow" the number of female appointments alone, she said. Other stakeholders in arbitration need to play their part in the effort. Richard Hill of Shell International appeared to place the blame mainly on law firms, stating that his corporation has no gender preference for arbitrators. Shell’s own legal team is two-thirds female owing to the number of women lawyers who move in-house, he said, and has received “fantastic service” from women in the arbitration field. Hill now insists that lists of potential arbitrators that come before him for consideration include women as well as men. Further discussion focused on an article published by John Gaffney, a senior associate at Al Tamimi & Co in Abu Dhabi, in Columbia FDI Perspectives earlier this year that caused controversy among members of the OGEMID online discussion forum. In this, Gaffney argued that the Pledge is "a laudable step in the journey towards increased diversity in arbitration" but "does not go far enough in its coverage of a limited category of persons" (women). Action on gender diversity is undoubtedly needed, Gaffney argued – but so is action to increase diversity in ethnicity, race, colour, culture, geography, political beliefs, age, religious beliefs, sexual orientation and socio-economic status. There should be sufficient diversity that parties view the tribunal as representing a "cross section of the business world" or an "idealised" version of it that is modern, creative and diverse. At the same time, Gaffney said the Pledge's scope of application "may potentially be too wide in another respect". He said a law firm’s promise to appoint a fair representation of female arbitrators where they have the power to do so "raises questions of how such firms are to balance their duty and their commitments under the Pledge". "Parties want to select the most well-known, experienced arbitrators. They are interested in winning their case – not changing the world," Gaffney explained. "Outside counsel's duty is to appoint an arbitrator in the best interests of the client, not necessarily in the best interests of diversity. This is not to suggest the two are mutually exclusive. However, I suggest it is a role best reserved to the Pledge's arbitral institution signatories when performing their appointment role." He quoted Shearman & Sterling’s head of international arbitration Emmanuel Gaillard: "Anecdotal evidence shows that institutions actively seek to appoint newcomers and promote diversity. It is the parties who resist change." In a response published on OGEMID, Noury and Miles said those who conceived the Pledge had not ignored other diversity initiatives but aspired to achieve gender diversity as a "first step" and to "start a conversation" on diversity that would benefit individuals and the system as a whole. They said that the quality of tribunals would be in no way "compromised" by parties being encouraged to consider "excellent" women arbitrators, noting that "merit and diversity are not in competition" and that the failure to consider female candidates would be to "dilute the excellence of our arbitral system." At GAR Live, delegates agreed that clients are well served by being told about women who are qualified to arbitrate their cases as well as men and noted that there is no obligation to appoint them. 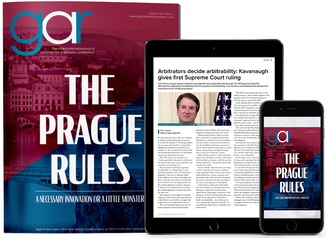 The Pledge’s website includes a tool whereby those seeking a female arbitrator can submit a form to a special search committee and receive ideas for potential candidates. ArbitralWomen also offers a large database of female arbitrators. In time, GAR’s publisher David Samuels suggested that GAR’s new Arbitrator Research Tool may also provide “a useful aide memoire” for those struggling to come up with female names. “We’re fast-tracking as many female candidates as we can,” he said. Iain McKenny of Vannin Capital also highlighted the role a newly established Paris-based institution, Delos Dispute Resolution, may have in helping young female (and male) arbitrators cut their teeth and just get the experience that parties look for when appointing. The institution aims to provide dispute resolution for start-ups – it has recently issued its first award, worth less than €200,000 in a dispute between two European companies in the “smart wearables” industry. Following the celebration of the Pledge’s anniversary, guests at the drinks party dispersed, with some heading for GAR Live’s speakers’ dinner and others for the Who’s Who Legal Awards at Plaisterer's Hall. Receiving the award of Arbitration Lawyer of the Year for the seventh time was Dutch lawyer Albert Jan van den Berg, who last year won a major victory for Russia when he persuaded the Hague District Court to set aside the US$50 billion Yukos arbitration awards (a decision which is now under appeal). Van den Berg was accompanied to the awards ceremony by Miles and another member of the Pledge steering committee, Mirèze Philippe, who is special counsel at the ICC and founding co-president of ArbitralWomen. He dedicated his award to the steering committee, telling GAR: "I don't know why I received my previous awards from Who's Who but I think I know why I got this one – my win in the Yukos set-aside proceeding. You would think I would wish to dedicate the award to my team. But instead I wish to dedicate it to the Equal Representation Arbitration Pledge, an initiative dear to my heart. Many have already signed the Pledge but this not enough – you have to bring it into practice. Arbitral institutions such as the ICC, LCIA and ICSID are doing their best but clients need to be persuaded that appointing women arbitrators is a good thing. You need proof? The proof is my team in Yukos – mostly women arbitration lawyers." White & Case was named Arbitration Firm of the Year for the second-time running, after being nominated more than 450 times by interviewees in dozens of countries during the Who’s Who research process. The firm has also led the GAR 100 for three years running, for the first two years alongside Freshfields. Arbitration Expert Witness of the Year went for the third year running to Philip Haberman of Haberman Illett, who has just been appointed to the LCIA board. FTI Consulting was Arbitration Expert Witness Firm of the Year, with 50% more Who’s Who nominations than any other such firm. Further coverage of GAR Live London will appear in GAR soon. The event co-chaired by Miles and Will Thomas of Freshfields included a session on the impact of damages; a question time with in-house counsel on "the business of arbitration"; and a new "inquisition" session in which a series of "witnesses" were grilled by a panel on whether international law is being formed through arbitration decisions and whether arbitrators are conscious of and responsibly performing their public function. Supporters of the event included Freshfields, Cooley, BDO, Linklaters, Therium, Maitland Chambers, Geotext Translations, the International Lawyers Network, ArbitralWomen and Newton Arbitration. The next GAR Live – GAR Live BITs – will take place in Washington, DC, on 23 May. The Pledge turns two: how are the numbers looking?